Bu çalışma, Matematik ile Bilgisayar ve Öğretim Teknolojileri (BT) öğretmen adaylarının okul deneyimi sürecindeki tecrübelerini incelemek amacıyla yapılmıştır. Çalışmanın odaklarından birisi, Matematik ve BT öğretmen adayları arasındaki benzerlikler ve farklılıkları ortaya koymaktır. Veriler 11 katılımcıdan elde edilmiştir. Sonuçlar, mentor ve uygulama okulu seçimlerinin, üniversitelerdeki danışmanların rehberliği kadar önemli olduğunu ortaya koymaktadır. Katılımcıların çoğu, üniversitedeki öğretilenlerle okullarda uygulananlar arasındaki ilişkilendirmenin yetersiz olduğunu düşünmektedir. Genel olarak, her iki bölümün öğretmen adaylarının benzer düşünceler sergilediği ancak BT öğretmen adaylarının daha çok okullardaki teknik altyapının yetersizliği ile ilgili endişelere sahip olduğu görülmüştür. This study aims to understand the experiences faced during school experience period of either prospective math or computer education and instructional technology (CEIT) teachers. Highlighting the differences and similarities between prospective math and CEIT teachers is also one of the purposes. Data were collected from 11 participants. The findings suggested that selection of mentors and practice schools have great importance as well as the true guidance of the university supervisor. Most of the participants agreed on the inadequacies of the tie between what is taught in campus and what happens in schools. In general, both groups of prospective teachers showed similar approaches, but prospective CEIT teachers were more concerned about infrastructural problems. Beck, C., & Kosnik, C. (2002). Components of a good practicum placement: student teacher per- ceptions, Teacher Education Quarterly, 29(2), 81–98. Boyd, D. J., Grossman, P. L., Lankford, H., Loeb, S., & Wyckoff, J. (2009). Teacher preparation and student achievement. Educational Evaluation and Policy Analysis, 31(4), 416-440. Carter, K., & Anders, D. (1996). Program pedagogy. The teacher educator’s handbook: Building a knowledge base for the preparation of teachers, 557-592. Cochran, K. F. (1993). Pedagogical Content Knowing: An Integrative Model for Teacher Preparati- on. Journal of Teacher Education, 44(4), 263-272. Coşkun, A., & Daloğlu, A. (2010). Evaluating an English Language Teacher Education Program through Peacock’s Model. Australian Journal of Teacher Education, 35(6), 24-42. Cothran D. J., Kulinna, P. H., & Garrahy D. A. (2003). ‘‘This is kind of giving a secret away...’’: students’ perspectives on effective class management. Teaching and Teacher Education 19. 435–444. De Lange, J. (1996). Using and applying mathematics in education. In: A. J. Bishop, K. Clements, C. Keitel, J. Kilpatrick, & C. Laborde (Eds. ), International handbook of mathematics education (pp. 49–97). Boston: Kluwer Academic Publishers. Ertmer, P.A., Ottenbreit-Leftwich, A., Sadık, O., Sendurur, E., & Sendurur, P. (2012). Teacher beliefs and technology integration practices: A critical relationship. Computers and Education, 59(2), 423-435. Everhart, B., & Turner, E. (1996). Preservice clinical experiences. The Journal of Physical Educa- tion, Recreation, & Dance, 67(4), 62-65. Feiman-Nemser, S. (2001). From preparation to practice. Designing a continuum to strengten and sustain teaching. Teachers’ College Record, 103, 1013-1055. Fırat, H.B., & Yaratan, H. (2013). Impact of external examinations on high school curricula: Perceptions of teachers and students. 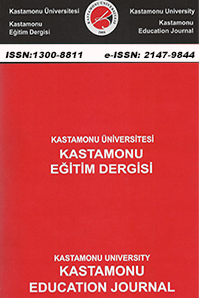 Egitim Arastirmalari-Eurasian Journal of Educational Research, 53(A), 1-18. Friedman, B., & Khan, P.H. (1994). Educating computer scientists: linking the social and the tech- nical. Communications of the ACM, 37(1), 65-70. Garcia, T., & Pintrich, P.R. (1992). Critical thinking and its relationship to motivation, learning strategies, and classroom experience. Paper presented at the Annual Meeting of the American Psychological Association, Washington, DC, August. Gainsburg, J. (2008). Real-world connections in secondary mathematics teaching. Journal of Mat- hematics Teacher Education, 11, 199–219. Goodland, J. (1990). Teachers for our nation’s schools. San Francisco: Jossey Bass. Graesser, A. C., & Person, N. K. (1994). Question asking during tutoring. American Educational Research Journal, 31(1), 104-137. Grudnoff, L. (2011). Rethinking the practicum: Limitations and possibilities. Asia Pacific Journal of Teacher Education, 39(3), 223-234. Hammerness, K., Darling-Hammond, L., & Bransford, J. (2005). Preparing Teachers for a Chan- ging World. What Teachers Should Learn and be Able to Do. In L. Darling-Hammond and J. Bransford (Eds), How Teachers Learn and Develop (pp. 258-389), Jossey-Bass: Wiley. Herbel-Eisenmann, B. A., Hoffmann, A. J., & Seah, W. T. (2003). Understanding mathematics le- arning and teaching through beliefs, values and norms. In 81st Annual Meeting of the National Council of Teachers of Mathematics (Research Presession), April, San Antonio, TX. Hidi, S. (2006). Interest: A unique motivational variable. Educational Research Review, 1(2), 69-82. Howey, K., & Zimpher, N. (2006). (Eds.). Boundary Spanners. Washington, DC: American Associ- ation of State Colleges and Universities. Iancu-Haddad D., & Oplatka, I. (2009). Mentoring novice teachers: Motives, process and outcomes from the mentor’s point of view. The New Educator, 5, 45-65. Jackson, P. W. (1974). Life in classrooms. New York: Holt, Rinehart & Winston. James C. MC, Virginia P. R., & Vicki E. B (2006). The Relationships of Student End-of-Class Mo- tivation with Teacher Communication Behaviors and Instructional Outcomes, Communication Education, 55(4), 403-414. Kelecioglu, H. (2002). Ortaöğretim Başarı Puanlarının Üniversiteye Girişte İki Aşamalı Sınavda Uygulanan ÖYS, ÖSS ve Tek Aşamalı Sınavda Uygulanan ÖSS İle İlişkileri, Hacettepe Üni- versitesi Eğitim Fakültesi Dergisi, 23, 135–144. Kennedy, M. (1999). The role of preservice teacher education. In L. Darling-Hammond & G. Sykes (Eds. ), Teaching as the learning profession: Handbook of policy and practice (pp. 54-85). San Francisco: Jossey-Bass. Korthagen, F., & Kessels, J. (1999). Linking theory and practice: Changing the pedagogy of teacher education. Educational Researcher, 28(3), 4-17.
self-regulation as predictors of long term educational attainment. Educational Research and Eva- luation, 6(3), 181–201. Leshem, S. (2012). The Many Faces of Mentor-Mentee Relationships in a Pre-Service Teacher Education Programme. Creative Education, 3(4), 413-421. Lincoln, Y. S., & Guba, E.G. (1985). Naturalistic inquiry. Newburry Park, CA: Sage. Lortie, D. C. (1975). Schoolteacher: A sociological study. Chicago: University of Chicago Press. Margolis, J. (2007). Improving relationships between mentor teachers and student teachers: Enga- ging in a pedagogy of explicitness. The New Educator, 3, 75-94. McCormack, A. (1997). Classroom management problems, strategies, and influences in physical education. European Physical Education Review, 3, 102–115. Meece, J. L., Wigfield, A., & Eccles, J. S. (1990). Predictors of mathematics anxiety and its inf- luence on young adolescents’ course enrollment intentions and performance in mathematics. Journal of Educational Psychology, 82(1), 60-70. Moyer P. S. & Milewicz, E. (2002). Learnıng to questıon: categorıes of questıonıng used by pre- servıce teachers durıng dıagnostıc mathematıcs intervıews. Journal of Mathematics Teacher Education 5, 293–315. Pamuk, S., Çakır, R., Ergun, M., Yılmaz, H.B., & Ayas, C. (2013). The use of tablet PC and in- teractive board from the perspectives of teachers and students: Evaluation of FATİH project. Educational Sciences: Theory & Practice, 13(3), 1815-1822. Pekrun, R., Goetz, T., Titz, W., & Perry, R. P. (2002). Academic Emotions in Students’ Self- Regulated Learning and Achievement: A Program of Qualitative and Quantitative Research. Educational Pyschologist 37(2), 91-106. Pintrich, P.R., Marx, R.W., & Boyle, R.A. (1993). Beyond cold conceptual change: The role of mo- tivational beliefs and classroom contextual factors in the process of conceptual change. Review of Educational Research, 63(2), 167–199. Retallick, M. S., & Miller, G. (2010). Teacher Preparation in Career and Technical Education: A Model for Developing and Researching Early Field Experiences. Journal of Career and Tech- nical Education, 25(1), 62-75. Richmond, V. P. (1990). Communication in the classroom: Power and motivation. Communication Education, 39, 181-195. Shulman, L. S. (1986). Those who understand: Knowledge growth in teaching. Educational Rese- archer ,15, 4-14. Shulman, L. S. (1987). Knowledge and teaching: Foundations of the new reform. Harvard Educa- tional Review, 57(1), 1–22. Simpson, A. W., & Erickson, M. T. (1983). Teachers’ Verbal and Nonverbal Communication Pat- terns as a Function of Teacher Race, Student Gender, and Student Race. American Educational Research Journal. 20(2), 183-198. Smith, K. & Lev-Ari, L. (2005). The place of the practicum in pre-service teacher education. The voice of the students. Asia Pasific Journal of Teacher Education, 33, 289-302. Steen, L. A., & Forman, S. L. (1995). Mathematics for work and life. In I. M. Carl (Ed. ), Prospectus for school mathematics (pp. 219–241). Reston: NCTM. Valencia, S., Martin, S., Place, N., & Grossman, P. (2009). Complex interactions in student teaching: Lost opportunities for learning. Journal of Teacher Education, 60(3), 304-322. Vertuno, E. M. (1995). Placing students in field experiences. In G. A. Slick (Ed. ), Preparing new teachers: Operating successful field experience programs (pp. 29-37). Thousand Oaks, CA: Corwin Press. Youens, B., & Bailey, M. (2004). The impact of quality assurance on mentor training in initial teac- her education partnerships: a UK perspective, Canadian Journal of Educational Administration and Policy, 32(1), 1–24. Zeichner, K. (1996) Designing educative practicum experiences for prospective teachers, in: K. Zeichner, S. Melnick & M. L. Gomez (Eds) Currents of reform in preservice teacher education, New York: Teachers College Press. ISNAD Yılmaz, Rezan , Şendurur, Emine , Şendurur, Polat . "Teoriden Uygulamaya Geçiş: Okul Deneyimi Sürecindeki Matematik İle Bilgisayar ve Öğretim Teknolojileri Öğretmen Adaylarının Karşılaştırılması". Kastamonu Eğitim Dergisi 24 / 3 (July 2016): 1517-1532.